Website visitor Robert S. wrote to ask that I post the text of this article for the Vertigo control line model. He already has the plans. Vertigo is a very unique model in that it has the form of a box kite, is designed to take off and land vertically, and uses a third line for throttle control to enable the VTOL function. A .15 size engine will do the job according to the designer, although a .19 is shown on the plans. An electric motor could be substituted for glow, but there is no direct equivalent to the third line throttle for a motor controller. There are schemes where an R/C transmitter and receiver are used for throttle control, but that is a cumbersome implementation. There have been attempts to send the control signal down an insulated third line, but again, there are no readily available solutions. Bill Young once offered a handle with 3 or 5 functions, but since he passed away they are no longer sold. Vertical Takeoff and landing model adds another dimension to control-line flying. 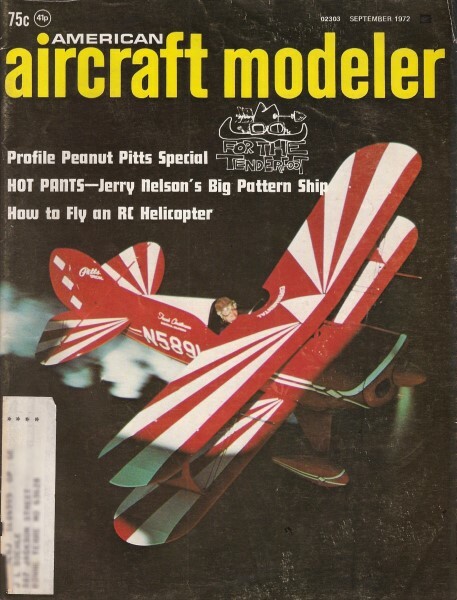 Of the many branches of the model aircraft world, most have their counterparts in full-size aviation. One major omission, however, is that of controlled vertical takeoff and landing. (The free-flight power fraternity might say they have been employing vertical takeoff for some time!) Some experiments by the writer with normal control-line models on very short lines showed that, providing the engine thrust exceeded the weight of the model, hovering flight could be achieved with reasonable control. It became obvious that a powerful elevator was required, as the only airflow over it was that provided by the slipstream from the propeller. The motor used was an old .15 cu. in. diesel, for which a throttle unit was obtained. Although diesels are not as satisfactory as glow motors for low-speed throttled running, this engine proved to be completely satisfactory - the control and pickup were adequate for the model. The fuel system required some thought as the tank would have to provide fuel with the model both vertical and horizontal, while stationary and at full flying speed. The tank needed to be as close to the engine as possible to reduce suction head effects, and the space available was restricted by the control mechanism. A 15 cc team race tank just fitted, and the vents had neoprene tubing raked forward to prevent spillage and to give a slight pressure feed from the slipstream. Third-line throttle control could have been operated in one of two senses: either opening or closing the throttle when the line was pulled. As it was not certain how much line tension would be available at the hover, it was thought wiser to allow the throttle to open, should the lines go slack. As it turned out, this had some unfortunate side effects to be described later. Because of the long stroke of the throttle arm, a straight tension or compression spring in the system would have given too great a load change, so an eight-turn torsion spring was wound from 0.036" piano wire, then fitted to the fuselage-mounted operating crank to return it to the "throttle open" position. The model was covered in heavy-weight tissue, the all-up weight coming out at 22 oz. The propeller was a nylon 10 x 4, which, although on the large side for the engine, was expected to supply sufficient thrust. The handle was a simple plywood design, fitted with a sliding center rod operated by the middle finger to control the throttle. The top (up) line went to the forward position on the elevator bellcrank to prevent crossing the lines during transitional flight. 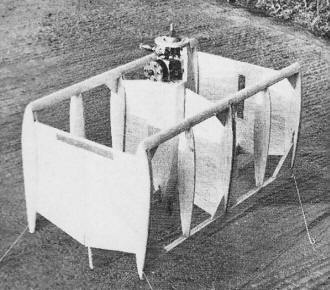 Short (30 ft.) thread lines were used for the initial flights as they are light and inexpensive. The major drawback was the high line drag at maximum speed, which applied a load to the throttle mechanism, closing it slightly and thus reducing the airspeed. This was not serious, however, and was overcome by fitting a weight to the operating crank, so that as the speed increased, centrifugal force on the weight increased, thus balancing the inward pull on the line caused by air drag. A fairly substantial amount of tip weight was added to the leading edge of the outboard end plate to give a safe amount of line tension at all times. The drawback was that the model wanted to fly with its nose pointing out of the circle, and tail first landings could not be achieved on all three points simultaneously. This was rather untidy to say the least, and usually resulted in the model turning over. The approach to vertical flight was made cautiously. First flights were made as a normal control-line model from hand launches. 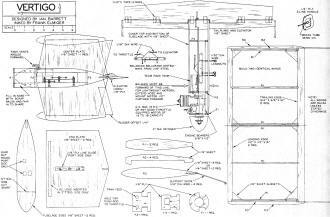 The fine pitch propeller, together with the high drag of the design, gave a low airspeed. The model had indications of being tail heavy, so the rear wheels were removed. This, combined with the increased confidence of the pilot, resulted in steadier circuits. The next step was obviously a vertical takeoff. Here it was found that the thrust from the engine was insufficiently in excess of the weight to give a reasonable acceleration upwards. An upward push was needed from the launcher, and unless· the launch was close to the vertical, the model would topple. 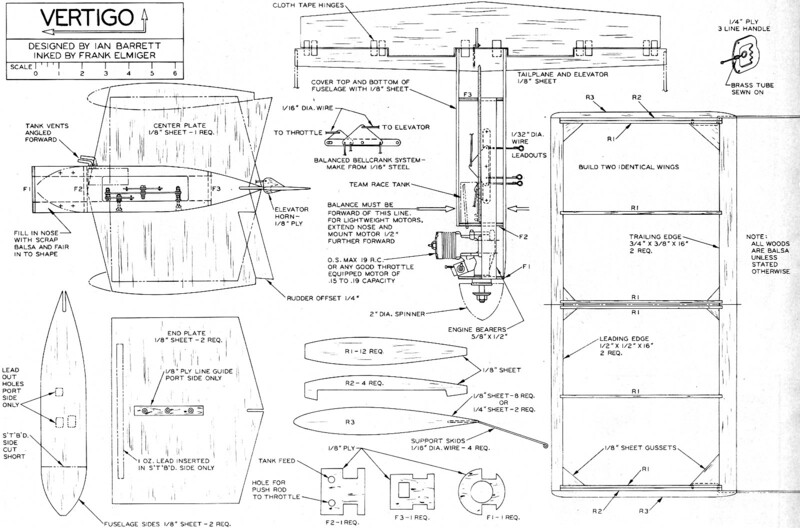 Inadequate elevator control was available to right the model, so flying was suspended while modifications took place. In not-quite-finished state, the model's light weight construction is evident. O.S. 19 does fine. The elevator area was doubled and some balancing area forward of the hinge line, in the slipstream, was added. With a selection of propeller sizes, we were ready to continue. Experiments showed that the engine had to be operated at peak revs, and a nylon 8 x 4 propeller gave sufficient thrust to allow a slow climb. This was the best we could do, and the full size practice of having thrust in excess of weight by about 20 per cent would also seem to be necessary for models. Elevator control was considerably improved. 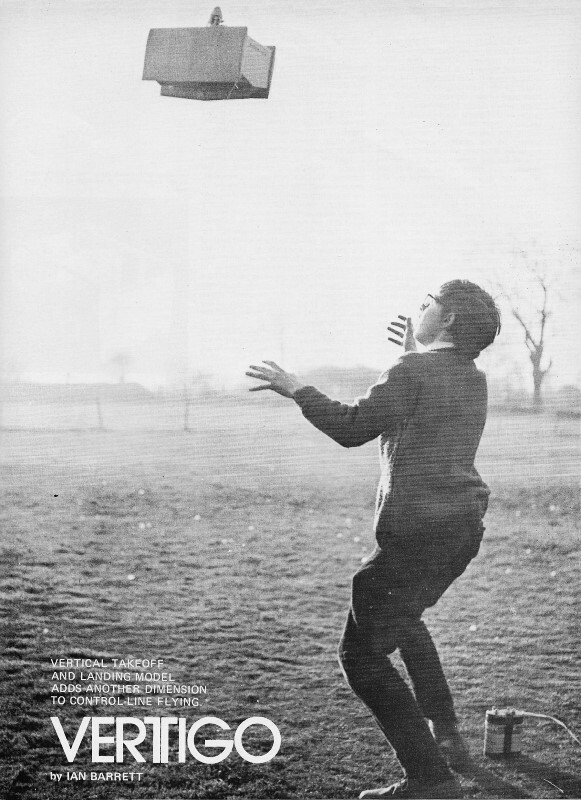 Control-line flying techniques had to be "unlearned," as the model was flying in conditions quite different than normal practice. The normal reaction, with a model apparently about to stall, was to get the nose down. Here the model was hanging on the propeller, and a rapid turn to the horizontal would deprive it of lift. A gradual transition had to be made. A few degrees forward rotation from the vertical gave a horizontal thrust component sufficient to start moving the model around the circle. As the speed increased, the angle of attack was reduced, and wing lift began to supplement the upward thrust component. About half a lap was required to reach normal flight, although this distance could be extended at will. We wonder if the design has any Combat event possibilities. How about that, a Combat biplane! Landing was the reverse of the take-off procedure. Closing the throttle slowed the model, and to maintain height, the angle of attack was increased. As the nose came up, the drag was overcome by application of extra power, until the model was once again hanging on its propeller. A slow descent could then be made on the throttle, quick blips being easier than trying to balance the thrust against the weight. It was the touchdown which caused the biggest problem. As mentioned earlier, the model leaned out of the circle and could not be set down squarely. When contact was made with the ground, the natural reaction of the pilot was to let the lines go slack to allow the model to and securely. This, of course, allowed the throttle to open, and off we went again. On the few occasions when the throttle was kept closed, there was still enough thrust to form a ground cushion and the model tended to skate about like a hovercraft. While the completed model is not scale of anything real, there are some real prop-driven experimental designs which could be built like this. The original model was becoming slightly the worse for wear, so the opportunity was taken to carry out extensive modifications. The wings were removed and the center wing supports cut to give swept fins. 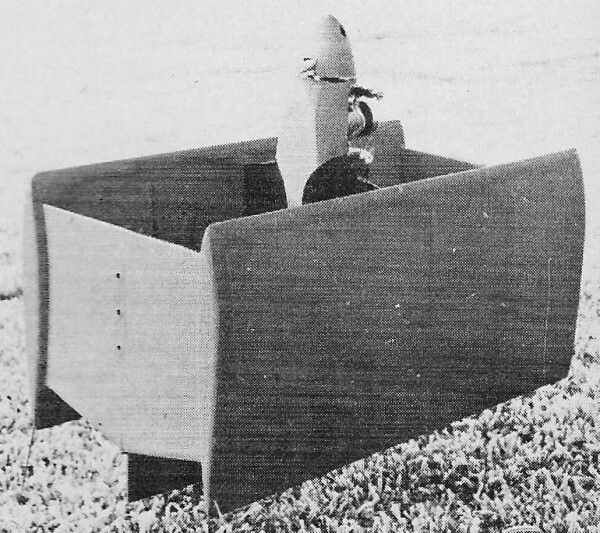 A hardwood spar was slipped through the fuselage, fortunately without fouling the control mechanism, and a slightly swept wing was built around it, using the original tailplane as the trailing edge. 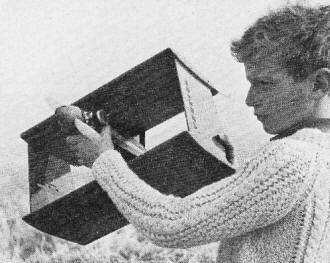 Tip weight was added to the outboard wing, and long wire supports trailed back from the extremities of the flying surfaces. Heavyweight tissue was again used for covering. The weight came out at 16 oz., and, as previous flights had shown the engine thrust to be a little in excess of 22 oz., prospects looked good. Flight tests confirmed this optimism by showing the model to be capable of a good vertical acceleration. It was obvious, though, that the model was excessively nose heavy, so wheels were added to the landing legs to move the center of gravity rearwards. This improved the handling of the model without adding unduly to the weight. This second model, however, suffered two major disadvantages. In the re-build from the original the control lead-out lines had been swept back, and because of the geometry of the bellcrank system, the throttle movement had become restricted. Also, the relatively high idling speed of the diesel was now further increased, and due to the lighter structure of the model, the residual thrust at the fully throttled position was only marginally below the weight of the model, making descent a long and difficult process. The interest that had been aroused by these models prompted the re-design of Vertigo I, incorporating the features thought necessary for complete success. The spring-loaded throttle mechanism was discarded, and a balanced system introduced as in Carrier models. A modern engine was obtained for better throttle response (an O.S. Max 19 RC), and the tissue covering of the wings was replaced by "Solarfilm." The final weight of this model is 21 oz., which is just about right for the motor. The first unit to build is the engine bearer control mechanism assembly. The balanced bellcrank system is supported from one bearer, and must be completely free in operation. With the fuselage formers in place and the engine bolted in position, the throttle link can be accurately positioned. Before adding the fuselage sides, glue in the center fin, cutting away the center to clear the control mechanism. Then add the sides, and when dry, the tailplane and elevator. Position the fuel tank as far forward as possible, so it does not foul the control mechanism. The wings are very simple, an identical pair being required. Make sure that the tip skids are firmly secured in place - they will have to absorb a fair amount of punishment. When you have made all the components, try fitting them all together and make sure the model is perfectly symmetrical and square. You are now ready to cover the model, remembering to keep the weight as low as possible by refraining from adding your favorite psychedelic patterns. 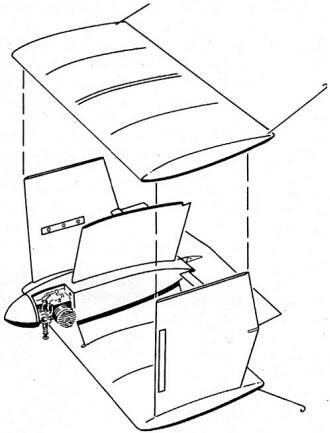 When ironing on the wing covering, do not completely shrink the film before cutting out the slots for the center fins and endplates, otherwise the ribs will bend. The film must be firmly affixed to the ribs next to the slots. Glue all the structure together, and when dry, the wing covering can be finally shrunk tight. Check the balance of the model and if any adjustment is required, add weight only at the extremities - either in the spinner or at the end of the tip skids. You are now ready for your first flights. Connect up your lines (not more than 30 feet initially) and check, with the motor running, that the throttle works smoothly over its full range. If you can fly over grass it is wiser to try a normal flight from a hand launch first to give you the feel of the model. This will also show you whether the balance is correct. If everything is satisfactory, bring the model to a nose high position, maintaining height by use of the throttle. With increased confidence you will progress to a point where the model is pointing straight up, and from where you can translate back to horizontal flight. When you have done this successfully several times, you are ready for touch and go landings, only a short step away from VTOL. A word of warning: there is only a limited fuel capacity, so keep your flights short. Power-off landings are not recommended, especially from the hover. If you think you can fly anything control line, then try this!